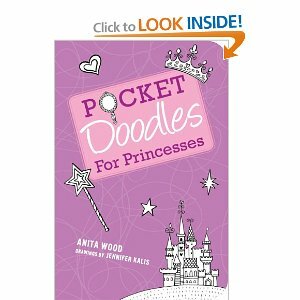 A little girls dream doodlebook! All things princess related from oriental, Spanish, snow, beach and other kinds of princesses. Become a fairytale artist as you design your dreams from the perfect castle to the shows and tiara you will wear. Princess ABC’s to draw through the alphabet from Angels to necklaces to unicorns.. all girlie prompts. Marketed for ages 8 and older for the finer details of drawing and being able to read the intro to each page. Darling book to tuck in the little princesses’ bag for car trips, long waits and or even sitting on the couch watching a show. Perfect size for a stocking stuffer for all the little princesses in your life! I love the transportable size, not big and bulky. Fantastic sentence and drawing starters to let their imagination run wild.